Oil prices continue to push upward on rising signs of falling Iranian crude exports before the imposition of new US sanctions, as well as a partial production shutdown in the Gulf of Mexico because of Hurricane Michael. Meanwhile, according to the last data from energy Services Company Baker Hughes released on October 5th, the average number of US oil-drilling rigs fell to 861 comparing to the 863 released on September 28th. In the meantime, markets remain cautious on the US Energy Information Administration (EIA) report on crude inventories due on Thursday, following last week’s number of 7.975 million barrels. On Thursday, we will have the release of EIA latest survey the report is expected to show a drop in crude oil stocks with estimates at 2.647 million barrels. Since the beginning of October, crude oil rallied more than 1.8% and remains in a bullish phase since early September. 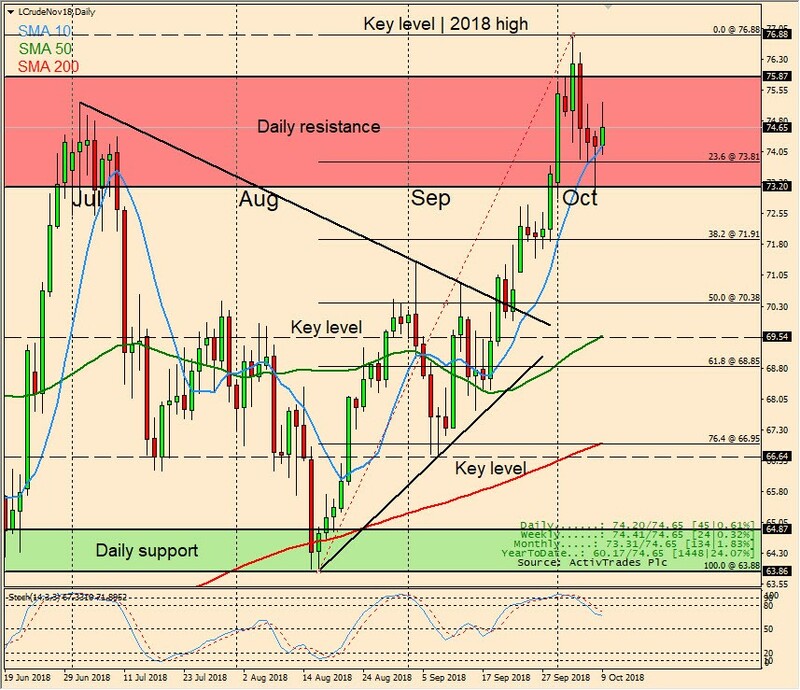 On yesterday session, crude oil rose after bouncing from the 10-day moving average, although, found enough selling pressure around 70.25 to trim some of its gains and closed in the middle of the daily range, in addition, managed to close shy above Monday’s high, which suggests a bullish momentum. The stochastic is showing bearish momentum, however, is still above the 50 midline. LCrude is a CFD written over Light Crude futures.